Singapore, September 2016 – In support of Singapore’s brands and fashion designers, and to better showcase them to a broader audience, Taff (Textile and Fashion Federation Singapore) has collaborated with local retailer, TANGS, a clear choice given their legacy of supporting local talent. The resulting collaboration is庄Zhuang – Home of Singapore Designers, a pop up supported by the Singapore Tourism Board and Epson Singapore, bringing fashion, art and technology together to create a unique and engaging retail experience. Multi-disciplinary artist, Daryl Goh, was commissioned to create Installation Lucid, an art installation that is a celebration of light, color, visuals and design incorporating projection mapping. Materials chosen for the art installation embody translucency, a celebration of light, color and clarity, but with consideration for other elements in its environment, while the projection mapping of moving images are a dynamic display symbolic of fluidity, adaptation and excellence – key conditions of production in design. 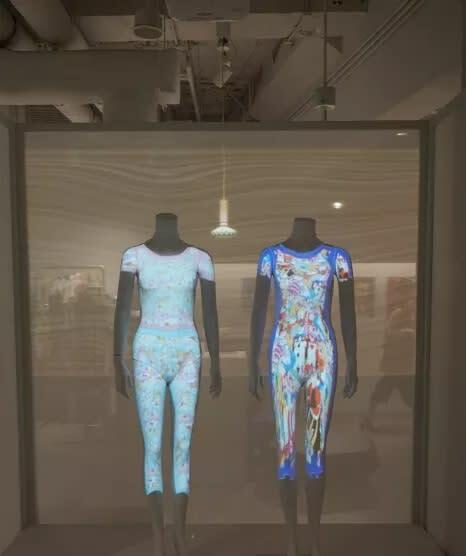 As part of the art installation, a rotating collection of outfits designed by local designers will be projected onto a mannequin showcase, and will be updated regularly. The project aims to showcase local designer brands through innovative use of high brightness and ultra-short throw technology for projection mapping, presenting a more immersive shopping experience. “We are excited to work with TANGS and Taff to showcase projection mapping at a retail mall in Singapore. Through this partnership, we hope to showcase the various possibilities of 3D projection mapping technology and how it can be used to create an immersive and experiential experience for viewers. The collaboration is also part of our efforts to contribute towards the retail scene and support local designers in Singapore,” said Tan May Lin, General Manager (Sales), Epson Singapore. The pop up was launched last 16 September 2016 and is situated at the fourth floor of TANGS at Tang Plaza, TANGS’ Orchard Road flagship store. As a complement to the host of Singaporean fashion brands already found on the second floor of TANGS at Tang Plaza, fashion labels selected for 庄Zhuang – Home of Singapore Designers are new to TANGS and positioned as new discoveries for the TANGS fashion customers. Notable names for the introductory phase of the pop up include apparel brands Frontrow by Klarra, Mash Up, Revasseur and Ying The Label, along with accessories from CN Collectiv and handbags by Desti Saint. The pop up also features a series of award-winning lifestyle brands like Supermama, Desinere and Hinika by Jarrod Lim, uniquely local collectibles from Love SG, Now & Then, The Farm Store and The Little Drom Store, and even local candlemakers Hush Candle and niche perfumery Code Deco, among others. Throughout its seven month duration, the pop up will see regular updates in its brand mix, with new brands constantly introduced to shoppers to keep them excited and engaged, while retaining selected brands throughout, favorites of locals and tourists alike. 庄Zhuang – Home of Singapore Designers is located at TANGS at Tang Plaza, Level 4 from 16 September 2016 (Fri) until mid April 2017. An icon of Singapore, TANGS is a leading player in the retail industry that has its fingers constantly on the pulse of the ever-changing consumer wants and trends. With the flagship TANGS at Tang Plaza's transformation completed, Singapore's most distinctive and beloved shopping destination raises the bar in retail, stepping up its role as a curator of a spectrum of exciting Asian as well as international brands, and redefining the shopping experience with a refreshed store concept. TANGS is present in Singapore and Malaysia with six stores, namely, TANGS at Tang Plaza, TANGS VivoCity, TANGS 1 Utama, TANGS Empire Subang, TANGS Genting and TANGS The Shore, Melaka. For more information, visit www.tangs.com. Textile & Fashion Federation (Taff) is the official association for the textile and fashion industry in Singapore, and plays an active role in the development of the industry representing and supporting members from retail to manufacturing. The Federation facilitates the growth of local fashion designers and retailers and advocates national pride to ‘Buy & Wear Singapore’. In line with government commitment, Taff is working to position Singapore as a fashion technology hub in Asia by showcasing technological innovation and opportunities for the industry. Taff further champions programs that build capability, market and expand Singapore’s fashion and textile businesses internationally, and promote environmental sustainability with eco-friendly business practices. With strong local and international networks, Taff is able to raise the visibility of local fashion brands and businesses at home and overseas. Epson is the world's leader in digital imaging solutions. The company’s Singapore operation is also the Regional Headquarters of Seiko Epson Corporation. The company markets and supports Epson printers, scanners, projectors, electronic devices including liquid crystal displays, semiconductors and system devices in South East and South Asia. The Singapore Tourism Board (STB) is a leading economic development agency in tourism, one of Singapore’s key service sectors. Known for partnership, innovation and excellence, STB champions tourism, making it a key economic driver for Singapore. We aim to differentiate and market Singapore as a must-visit destination offering a concentration of user-centric and enriching experiences through the “YourSingapore” brand. For more information, visit www.stb.gov.sg orwww.yoursingapore.com or follow us on Twitter @STB_sg (https://twitter.com/stb_sg).